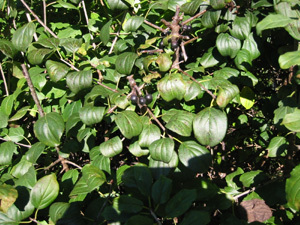 Common buckthorn was once imported because it yields a tight, fast-growing hedge. Now considered one of Ohio's worst invasive plants, it has no natural enemies and recovers from even the heaviest cutting. Buckthorn and its fellow invader Japanese knotweed are the most common shrubs in Oberlin's parks! Oberlin needs a city-wide plan to control these pesky invaders. The city must take responsibility for public parks and Oberlin College for the Arb. The city could provide an information packet that helps homeowners identify and control these species and work with local nurseries to suggest replacement plants that are native to Ohio. If we replace the buckthorn hedges in Oberlin with native plants such as elderberry, chokeberry, and wild cherry the result will be a better habitat for wild birds and animals. Think globally, act locally! There are plenty of attractive, easy to care for native shrubs we can plant instead of buckthorn. Here are a few I like! There are quite a few of these growing wild in the Oberlin area. 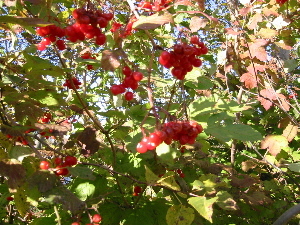 Flowers, interesting leaves, edible (although bitter) red berries. 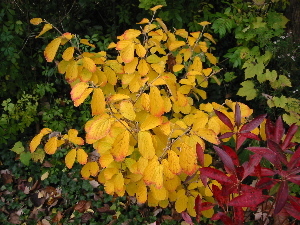 This is the plant that witch hazel extract is made from. It flowers in the winter! This is a great plant. It is tough and carefree. 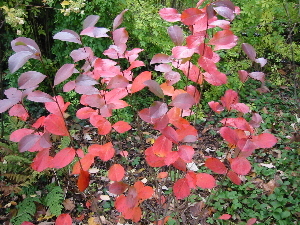 It has the glossy leaves like buckthorn but also beautiful white and red flowers in the spring time and great fall color. The only problem we have had with ours is that rabbits attacked them in the winter! This plant had no buds left in March and has grown back to 3'.